Monitor how much exposure to the home language your child is receiving. If the parent who speaks the home language is also away at work most often, it will take much family and community support and resources to make sure the child hears and speaks that language enough with other adults and peers to reach the desired level of fluency. Try to provide your child with daily opportunities to learn and repeat a rich and varied vocabulary. Try not to switch languages (Not the same as “mixing languages”) This often happens following a relocation, or because of pressure from school officials to drop the home language. The language we use to identify the world around us, and to communicate our feelings, our beliefs, and our values, is difficult to change without causing damage to the emotional bond we’ve created with our children – and oftentimes, will cause a delay in their language development. Since one of the most influential factors in our children’s bilingual development is how much language they hear every day, we need to talk! Try to narrate every single thing you do around the house! When it starts to feel awkward, remember that, according to the research, the number of words a child hears throughout the day is directly linked to the child’s intelligence and vocabulary size. I love this one because I’m all about free resources! I hope together we can build a network – to encourage each other, support each other, and find creative ways to keep our children bilingual! A bientot! As for me, I just love to pack and I love to get on an airplane. Probably why I married a pilot. I’ve relocated 20 times in 39 years – some exotic, some not-so-much – but since relocation is the 2nd most stressful experience you can have, after losing a loved one, I probably should take up yoga or meditation, just in case. In our family we like to call ourselves global nomads and trips are always on our minds. Whether it’s taking our VW bus to the White Mountains of NH or flying to Guayabitos, Mexico, to play on the beach. Naturally, I wonder what will happen to all that when our girls start preschool in September. I’m curious to see how we handle the school years, after all that freedom… Is homeschooling in our future?? For now – here’s what I’m working on. Finding ways to keep our children bilingual while living in the US. I started researching the topic 4 years ago, both for personal reasons and for my Master’s (in Intercultural Relations). I also interviewed other parents who successfully raised happy, bilingual children. 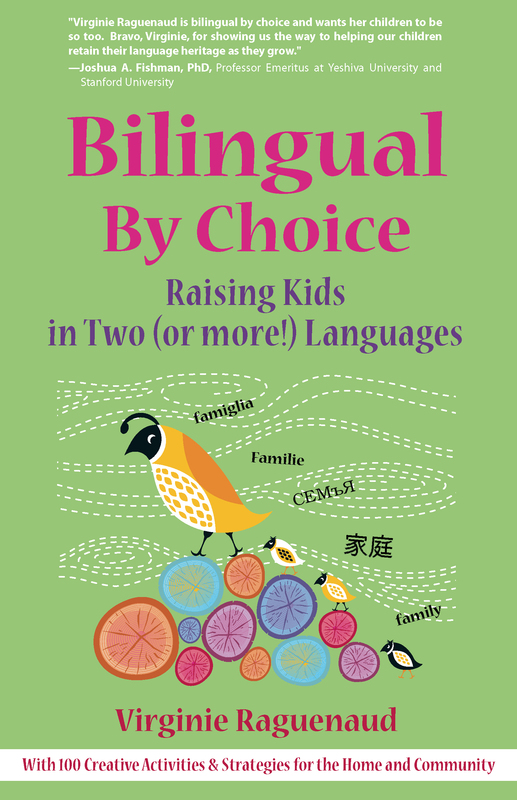 I eventually wrote a book on the topic that just came out – it’s titled Bilingual By Choice: Raising Kids in Two (or more!) Languages – published by Nicholas Brealey Publishing. You can check out their website at nicholasbrealey.com or bilingualbychoice.com for more information. In the book I talk about both sides of the growing-up-bilingual journey, as a child and as a parent. I’m considered a “late” bilingual. I moved with my family to the US from France when I was 12 years old. I remember standing in the principal’s office trying to put a complete sentence together, but all I could muster – with my head up high – was “I…France!” That’s how limited my English was. But my sisters and I eventually learned it the way many children do when they need it to survive! One common obstacle we face when trying to keep our children bilingual is to stay motivated and find fun and creative activities to keep our language relevant. To help parents, I list 100 activities in the book, to use both at home and in the community to expand our children’s vocabulary and their cultural knowledge. I’ll discuss them here so stay tuned!